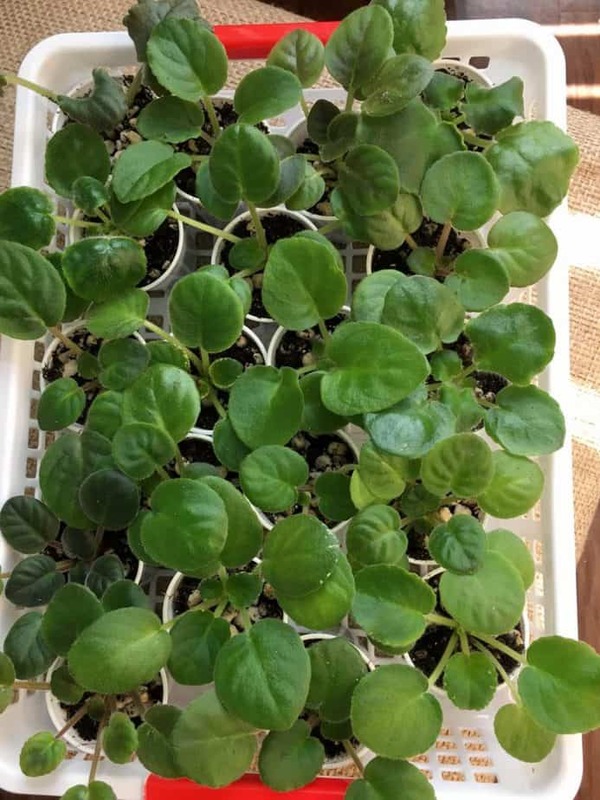 What I love most about African violets is starting out baby plants from leaves. It is exciting to see tiny leaves pop up from a leaf and eventually bloom for the first time! 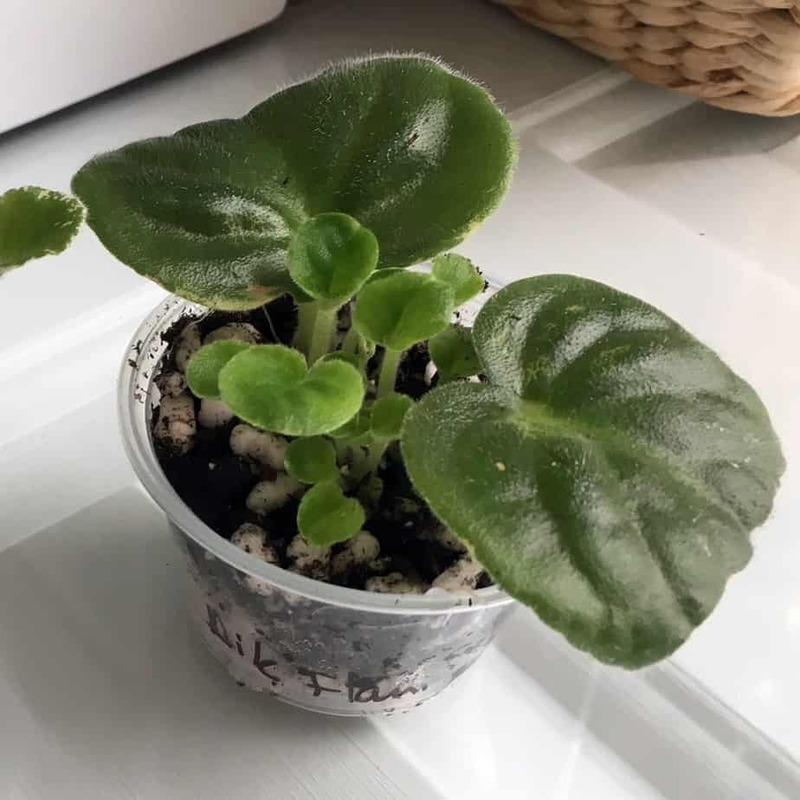 Because this is my favorite aspect of our hobby, I’ve had a lot of practice to show you to grow an African violet from a leaf. 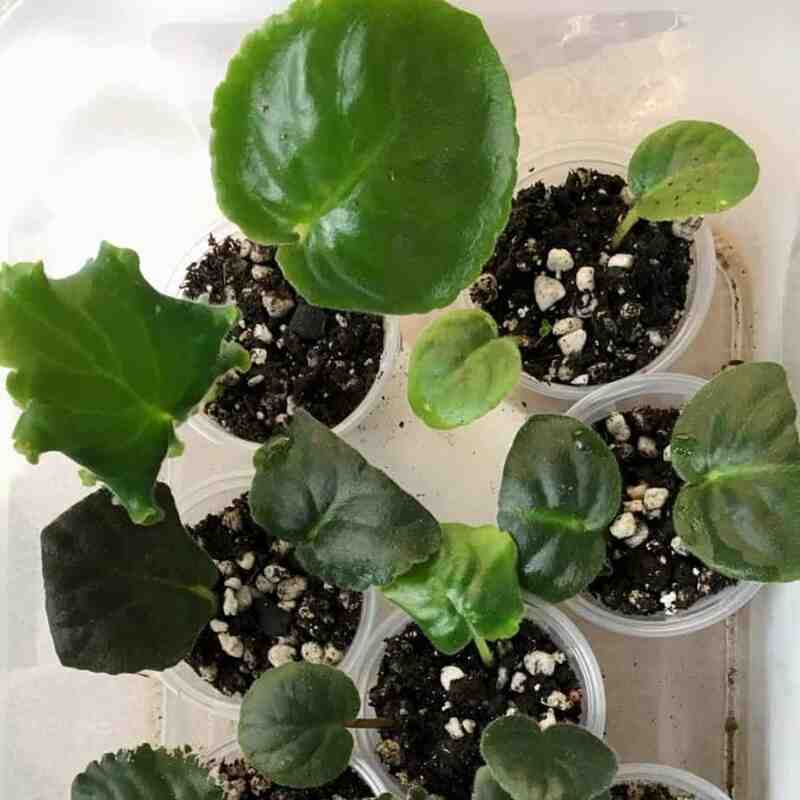 When you get a leaf home, you want to ‘sanitize’ it to ensure you don’t run the risk of bringing in any unwanted pests, eggs or fungus that can infect your entire collection. I always soak leaves for about 30 minutes in a 1:10 bleach and lukewarm water solution with a couple drops of blue Dawn dish soap. Be sure to submerge the entire leaf. After 30 minutes, rinse with lukewarm water and pat dry. This will cause no harm to the leaf. What if the Leaf is in Bad Shape? Translucent or Brown Spots – If the leaf has significant damage, it’s best to trash it to avoid contaminating your collection. If you have just a few spots that you know is cold damage, cut off those spots to keep them from spreading. Limp Leaves – Sometimes you will get a leaf in the mail that is completely limp. The good news is that as long as it is still green, you can save it! First cut off a sliver of the end of the stem. In a bowl of lukewarm water, add about 2 teaspoons of sugar and 2-3 drops of SUPERthive. Mix well. Add the leaf to the bowl and completely submerge it. You can also put the bowl under low light. 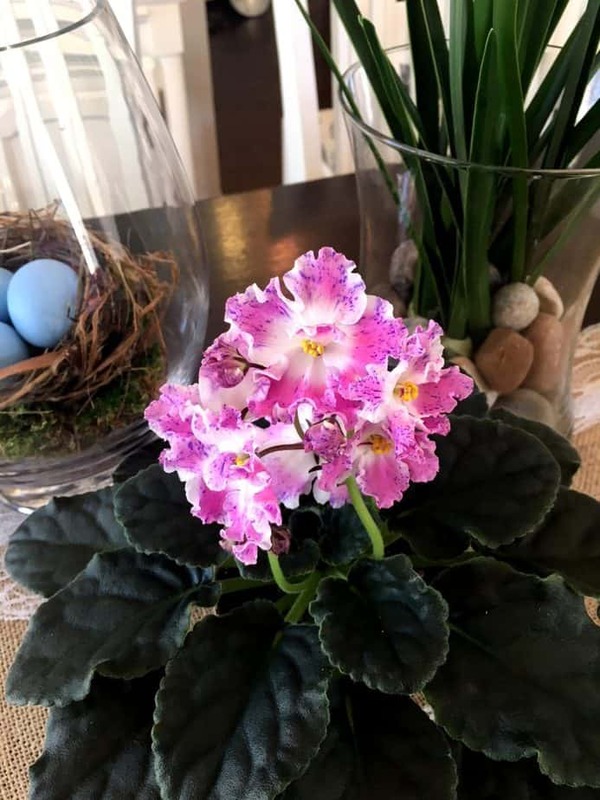 (Click HERE for my post on how to grow plants with LED lights). Keep the leaf submerged for anywhere from a couple hours to overnight. Before you know it, your leaf will look as good as new. By using this method, I’ve never lost a dehydrated leaf. When you are done, rinse the leaf and pat it dry. Once you have a healthy, green, hydrated leaf, you can “put it down”, which means creating a culture where it can put down roots. Cut the stem to about once inch and at the greatest angle possible. The wider circumference of a more angled cut allows room for more babies to grow! Now, I put the leaf in water and wait for roots to start. I prefer this method to putting the leaf in soil initially. 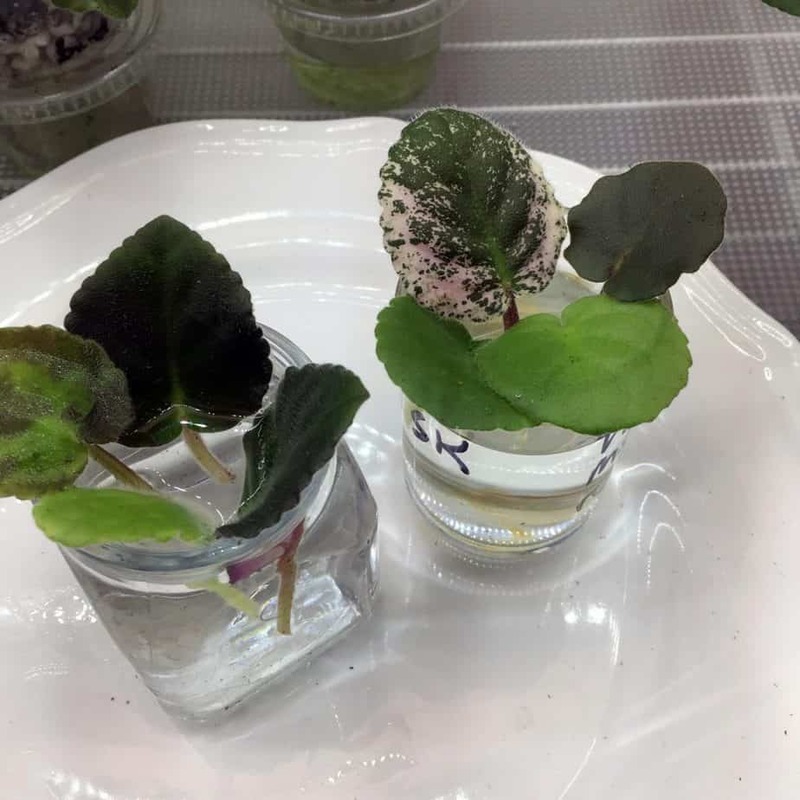 With starting them in water, the leaves will take longer to start roots, but if you compare a 6-month old baby started in water to a 6-month old baby started in soil, you will see that the one started in water is a larger, healthier plant. I like to use glass candle votives to start roots. You can write the plant name on the side with a Sharpie and the writing will disappear in the dishwasher. 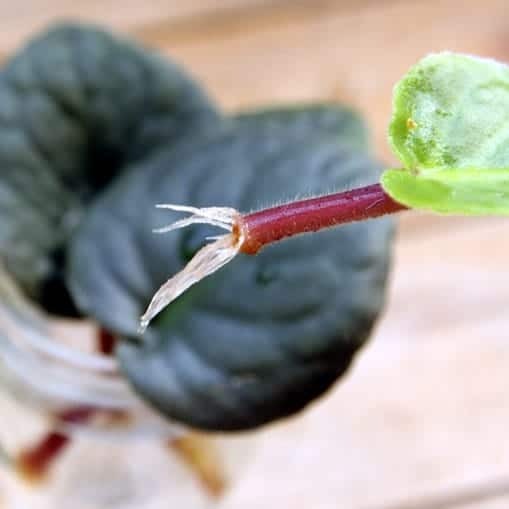 Leaves take about 14-18 days to start roots depending on the time of year. When the roots are about ¼” in long, it’s time to put the leaves in soil! I like to use 4 oz. condiment cups with large holes in the bottom as pots. 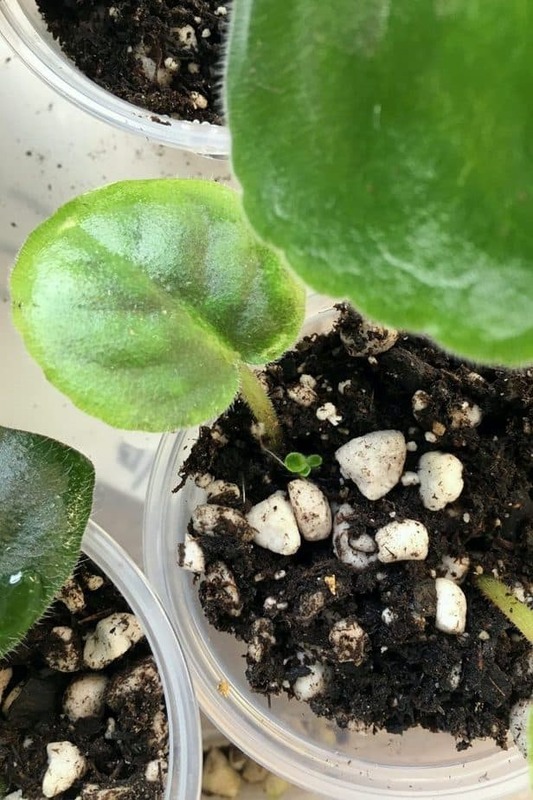 I feel like leaves start babies faster when they are in the presence of other rooted leaves, so I put two or three leaves in each cup. Be sure to label them well. Plant your leaf in the soil so it just covers the roots. Water the cup just slightly so it is barely damp and then squeeze the cup a couple of times to help aerate the soil. (I water leaves and babies with my usual fertilizer water). The number one rule is to not let the soil get too wet. It should be just damp, comparable to a wrung-out sponge. Usually, the leaf pots that I somewhat neglect are the ones that do the best because they are dryer! I like to put all of my leaf pots in plastic containers with some saran wrap over the top. Once you put the saran wrap over the top of your container, vent it slightly on two corners. You want to see tiny mist-like droplets of humidity on the inside of the saran wrap. 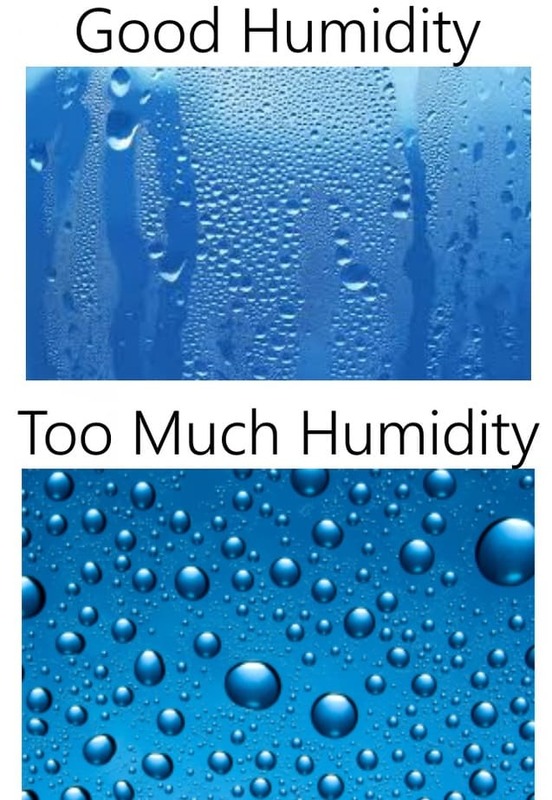 Leaves thrive in a high-humidity environment. However, if you see large water drops, you want to vent the container a little more. I sometimes secure my saran wrap with scotch tape to keep it in place. After a couple weeks, check your leaves. I like to use a pipette to add a few drops of water to each container. Babies will start to appear after a few weeks. This is where some patience is required! After I start to see baby leaves, I begin weaning the babies off the mother leaf. Every two weeks when I water them, I also cut a tiny sliver off the top of the mother leaf. This does a couple things: For one thing, it causes the baby to depend less on the mother leaf. Also, when the leaf is cut, it releases a small puff of Ethylene gas. When plant cells are broken or cut, they release ethylene gas. In nature, this seems to be a signal that a predator is feeding. Theoretically, the plant responds by increasing the rate of photosynthesis in order to survive. Therefore, the babies respond to the ethylene gas by growing faster. Every two weeks, I also slightly squeeze each of my leaf pots. This helps to stimulate the roots and aerates the soil. 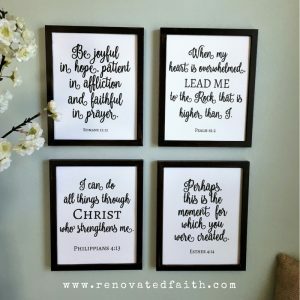 When Do You Cut Away the Mother Leaf? When the baby leaves are mostly green and are larger than a dime, I cut away the mother leaf. When Do You Separate the Babies? I like to separate the babies when most of the baby leaves are the size of a quarter. If the babies seem especially cramped, I separate them sooner and plant them in 3 oz. solo cups. Take your time and be very careful separating the babies from each other. I like to separate the leaves and leaf stems first and slowly separate the roots next. I like to put my separated babies in a container with saran wrap similar to the leaf pots. When they have established stronger root systems, I slowly start to pull away the saran wrap to acclimate them to normal humidity. Then I wick them and put them with my other plants. What if the baby leaves are mostly white? In my experience, these leaves green up as the plants get older but you can also add Epsom salt water to speed up the process. Add one tsp of Epsom salt to a gallon of water and water as normal. What is the white powdery substance on my leaves? That is most likely powdery mildew. I like to use Lysol spray (do not use the off-brand – ask me how I know!). Spray it in the air above the leaf. Then, let the spray drift onto the leaf. This will kill the powdery mildew and prevent it from coming back. Why do my leaf’s roots look thick and gnarled? Your soil is too moist. Let it dry out a little. 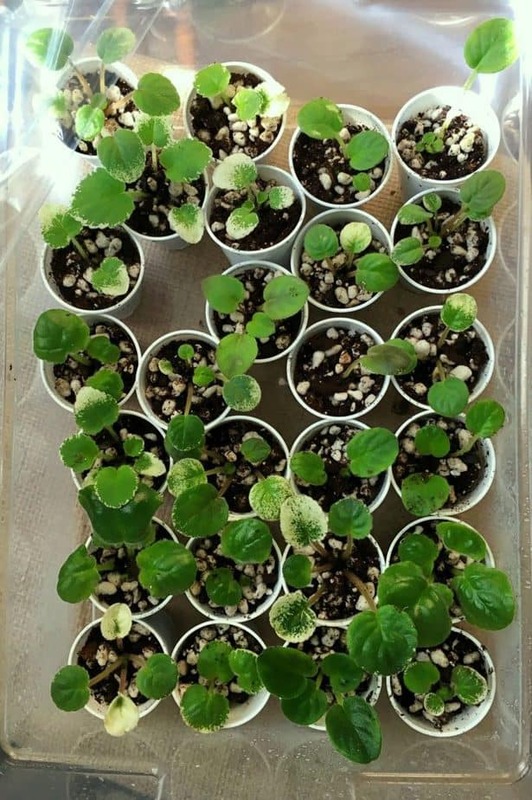 These are my best tips for starting baby plants from leaves. Follow these tips and you will have babies blooming before you know it. Sometimes the results might surprise you!